A simple workflow defining the scenarios/test cases, the cloud services and Environment, Perform test execution, and analyze the test results. 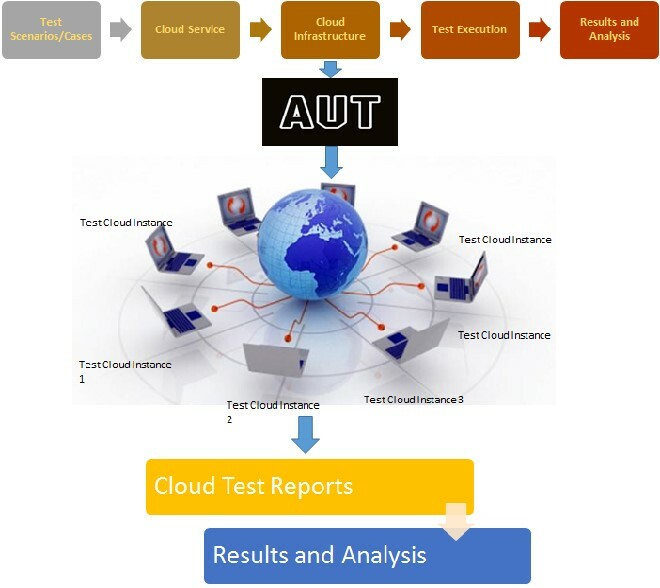 Application under test (AUT) to be placed in the cloud instance of the cloud infrastructure. Get the reports and analyse the reports. Our cloud testing solutions help organizations enhance its effectiveness with reduction in testing cost and shortening the running and delivery time as servers are available as and when needed on demand. At TYSS for any type of cloud testing we ensure that we have access to the cloud services and data needed without any sort of delays. We ensure the experience of the cloud service that of a local server though the server is hosted in cloud remotely. TYSS is capable of providing testing services where the testing activities needs to be accomplished in cloud environment. Convert the entire application setup into one or more S3 images (Instances) and set them up to communicate to one another. AWS provides ways to configure each EC2 (Elastic Compute Cloud) instance to communicate. Firefox plugin called Elastic Fox is one; the second is an Ajax-enabled AWS management page. We use Google's Deployment Manager which is a template-driven service which helps in defining test environment with virtual machines, storage, load balancers and other resources for deploying resources in the cloud. Google's Cloud Monitoring service helps in generating alerts and populates performance dashboards in a production environment. Performing stress tests on new application code is helpful too. TYSS performs cloud testing in with the help of Microsoft Azure testing tools for cloud applications. Microsoft's Visual Studio Application Insights is a new service in preview mode that will likely become a key cloud testing and monitoring service. This helps to monitor ASP.NET and Java applications running in Azure or other platforms along with mobile apps, such as those for Android and iOS, as well as Mac OS X and Windows applications. With Azure automation we can reduce manual and repetitive tasks with consistent testing in the cloud.